Significant advances in artificial intelligence (AI) over the past decade have led to many debates about the potential social, economic, and security impact of AI. However, little sustained attention has been paid to the impact of AI on international relations or how the technology impacts the work of diplomats and policy makers. Advances in AI have put new topics on the international agenda, challenged geostrategic relations, served as a tool for diplomats and negotiators, and created new opportunities and concerns about human rights. Join DiploFoundation and the Center for Data Innovation to learn about key findings from the new DiploFoundation report Mapping AI’s challenges and opportunities for the conduct of diplomacy, commissioned by the Ministry for Foreign Affairs of Finland, and a discussion on the need for further research, capacity development and practice in the sphere of AI and international relations. Presentations and talks will be held by stakeholders from governmental organizations, the private sector, and civil society. Maaike Verbruggen, PhD Researcher International Security, Institute for European Studies. Follow @DataInnovation and join the discussion on Twitter with #datainnovation. 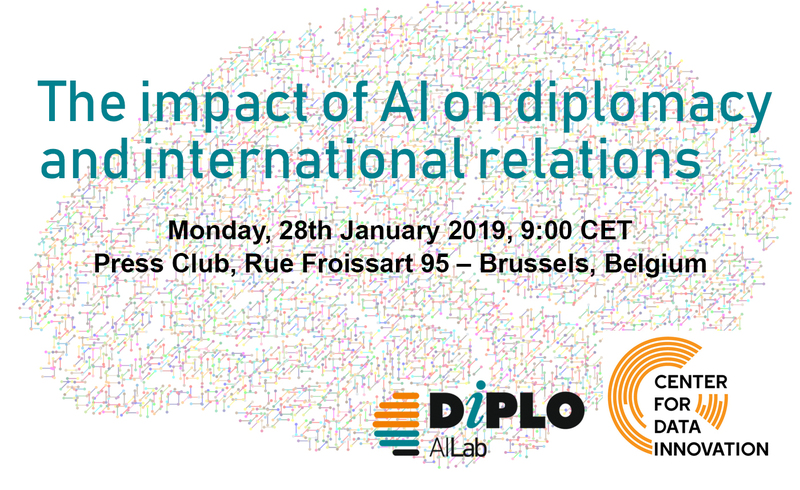 The report maps out the field of AI and diplomacy through a discussion of AI as a tool for diplomatic practice, a topic for diplomatic negotiations, and an element shaping the environment in which diplomacy is practiced. This panel will explore the geo-strategic shifts AI innovations have led to, and highlight some of the most important changes that can still be expected. The panel will look at how countries are beginning to position themselves in relation to AI and explore relevant AI strategies. The panel will also discuss where Europe fits in, alongside the United States and China, and whether there should be a distinctive European approach to AI. Lastly, panelists will consider the ability of countries to harness the power of AI, and examine the concerns about a widening digital divide between developed and developing countries. A number of professions are already using AI, and the technology may become a key tool for diplomatic practice as well. Through the use of natural language processing and machine learning in particular, advances in AI can support part of the work of diplomats—for instance in the preparation of negotiations and research. How can diplomats benefit from this emerging technology, and what are the obstacles to its adoption and use? This panel explores ethical considerations around AI. Existing and emerging initiatives, such as those by the Council of Europe and the European Commission, offer useful guidance in this debate. How can the existing robust principles of non-discrimination, ethics, and privacy inspire and be applied to existing frameworks in international relations? Panelists will discuss the key ingredients for these frameworks to effectively support the development and use of AI while addressing the human rights and ethical questions it leads to.